Glenn Ferguson will want his Ballymena United side to improve their dismal points tally against top six sides next season. Picture: Pacemaker Press. It may have been about as end-of-season a game as you can imagine, but there was one interesting statistic to emerge from Ballymena United’s win at Drumahoe on Saturday. A 2-1 success at Institute meant that for the first time since the ‘split’ format came into operation in the Danske Bank Premiership seven years ago, Ballymena completed a clean sweep of four wins from four league games against the same team. You might think there’s little importance in that, beyond a slightly quirky stat, but it’s perhaps more significant when you place it in the context of United’s overall league campaign. With two games to go, Ballymena can still pass the 50-point barrier which they have managed only one in those seven years - in 2011/12 when they finished on exactly 50. 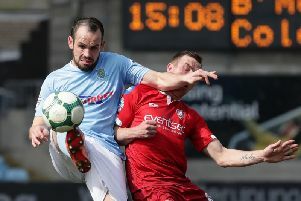 It has long been part of the fabric of any Ballymena United season that there will be unexpected wins against higher-ranked teams, negated by inevitable slip-ups against teams that Ballymena would have been expected to beat. This year has been slightly different, however. Results against the top six sides have been harder to come by as the gap between the top and bottom half grows wider each season - something that will be fuelled further in the coming years as UEFA announce greater prize money for teams competing in European competition. In contrast, Ballymena have scored heavily against the sides down with them in the bottom half. I’ve already mentioned the 12 points out of 12 against Institute while Ballymena also claimed nine out of a possible 12 against Coleraine and seven from 12 against Warrenpoint. Ahead of the final two fixtures, Ballymena have already scored six points from nine against Ballinamallard and four from nine against Dungannon. That means a staggering 38 of Ballymena’s 45 points to date have come against sides in the bottom six. Of the paltry seven points gained against top six sides, six of them came before the end of September. So in the last six-and-a-bit months, Ballymena have managed just one solitary point - the unforgettable 5-5 draw at Portadown in January - against a top six team. Don’t get me wrong - I’m not a subscriber to the theory that points against a lesser side somehow aren’t as important. But it’s a chilling reminder, irrespective of how many league points Ballymena eventually end up with, that they are still a considerable distance short of even scraping into the top six, never mind establishing themselves in that lofty bracket. This summer will unquestionably be the most important of Glenn Ferguson’s tenure in terms of quality player acquisitions because without them, that gap is likely to widen even further next season. * Follow Ballymena Times Sports Editor Stephen Alexander on Twitter (@Stephen_Bmena).